You should always check the labels of a taste repellent if you intend to use it on vegetables and herbs. Some of them are not approved for food crops because they leave a bad taste for us as well as for the rabbit. See the end of this file for available products. All natural, long lasting Liquid Fence Deer and Rabbit Repellent will stop deer and rabbits from eating your flowers, shrubs, vegetable plants, trees and vines. And rest assured, it won't harm your plants or animals. It's so effective, we back it up with a written 100-Percent money back guarantee. This amazing repellent has two times the power of the other brands! The formula contains the highest concentration of the scent deterrent putrescent egg on the market - 4.63%. Putrescent Egg Solids simulate the odor of decaying protein � signaling a predator is looming nearby. This repellent effectively protects against and prevents rabbits and deer from eating your plants, bulbs, flowers, trees, ornamentals, seedlings, shrubs, and fruit & citrus trees. The spray on application is ideal for surface area protection and is ready-to-use so there is no mixing required. Apply as directed when you notice rabbits and deer beginning to browse. Reapply every three months or more frequently if deer and rabbit pressure is intense. This OMRI listed product works year round, and when used as suggested, it also protects against damaging winter browsing. Traditionally homeowners have resorted to repellents of some sort to discourage rabbits from eating plants in their yards. The list of smell related home remedy substances is lengthy. It includes mothballs, creosote oil, cat fur clippings, fox urine or tiger manure from the local zoo. There is no reliable evidence that any of these things are effective, but you can always find an advocate down the road. See the end of this file for available products. Similar to taste repellents, the hot pepper burning sensation is effective in deterring rabbits in the vegetable garden. It does not effect the taste for people if the product is washed before consuming. SCARECROW is a motion-activated water sprinkling device that repels pest animals such as Rabbits by startling them with an unexpected spritz of water. SCARECROW is highly effective, is environmentally friendly and very humane. It does not hurt the animal. The effect of the sudden noise, movement and spray of water is both startling and immediate – animals quickly flee the area and avoid returning in the future! It will not activate for song-birds. Repel by model of predator – There are models of owls and snakes which have been designed to frighten rabbits. These products work best when you move them around every day or two so the rabbit does not get used to the position. The realistic Easy Gardener 8011 Garden Defense Action Owl is a chemical-free, environmentally friendly way to control pests. 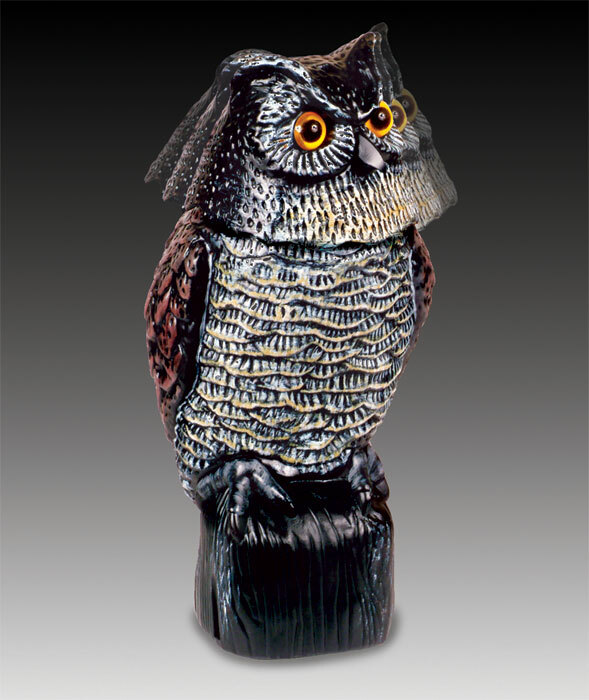 Scare away birds and vermin with this great horned owl look-alike--when the wind blows, the head of the Action Owl bobbles and spins, adding to its lifelike qualities. And as attractive as it is useful, the Action Owl is a great patio accent, garden feature, or lawn ornament for any home. A gentle breeze causes the Owl's head to move back and forth, frightening pests. Designed to look exactly like a great horned owl, the Action Owl features large, yellow eyes, a tilted head, ear tufts, and intricate hand-painted details on the body. 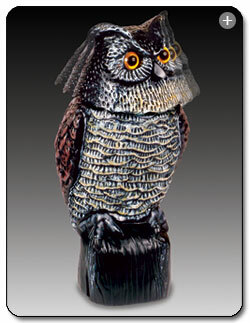 The Action Owl's head bobbles and spins with the slightest breeze, adding to the realistic effect. Imitating the look of a predator bird to protect your fruits, vegetables, and flowers, the Action Owl can be used year after year to frighten away birds, squirrels, rabbits, rodents, and other destructive pests. Because the Owl uses no chemicals, this form of pest control is safe and environmentally friendly, and it can be used for years to come. The head of the Action Owl bobbles and spins whenever there is a slight breeze, scaring away garden pests with its realistic looks movements. The motion is activated by the wind, so there are no batteries to buy or replace. If you choose to place your Owl in a protected part of your garden, or you don't experience a lot of wind in your area, simply attach the Action Fin to the back of the bobble head to help catch breezes. With several options available for installing the Action Owl, you will quickly find the most effective spot in your garden. Mounting the Owl on a pole is easy with the molded-in pilot hole on the bottom of the base. Another option is to fill the base with sand and place the Owl between the rows in your vegetable patch or on your patio. In many cases the territorial markings that your male cat sprays around your property (and his presence) may be as good a deterrent as there is. A dog or cat roaming the yard often discourages rabbits from coming onto the property. Male cats and dogs mark their territories with urine which assaults the rabbits’ keen sense of smell. It establishes an invisible barrier that is often, though not always, quite effective.